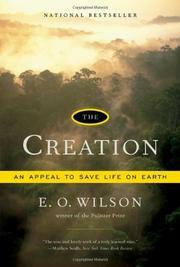 Celebrated conservationist par excellence Wilson (The Future of Life, 2002, etc.) sings familiar tunes in a short text that exhorts religionists to join in saving the planet. The author preaches to the choir here, but it’s a fairly select choir prepared to hear evolution defended over creationism and to have Intelligent Design dismissed as non-science. Interestingly, Wilson’s condemnation of all that modern society has wrought on the environment jibes with the Christian sentiments expressed in the old hymn: “Every prospect pleases but only man is vile.” To be sure, some fundamentalist groups have raised concerns about global warming, so the biologist may not be off the mark in seeking new alliances, but the “Dear Pastor” approach seems more like a gimmick to trot out the latest figures on habitat loss, invasive species, pollution and overharvesting, all made worse by global warming. Wilson states a variety of principles in defense of conservation and biodiversity. These include his views on human nature and instincts and what he calls biophilia, an innate human affinity for the living world. Wilson sees biophilia manifested in the kind of place people prefer to live—at a height looking out at parkland and near a body of water. He sees this as nothing less than a species memory of the savannas where Homo sapiens emerged. Trying to mitigate all the dire data, Wilson goes on to describe what is being done and what can be done to counter the destruction. For example, the major global “hot spots” in need of immediate preservation have been defined by Conservation International, with projections made about the cost of saving them using current technologies. In the end, he concludes, science education may be more important—and as an added fillip for readers familiar with the conservation agenda, Wilson enumerates the pedagogic principles that have endeared him to many generations of Harvard students. A repackaging and updating, yes, but if it wins new adherents, why not?